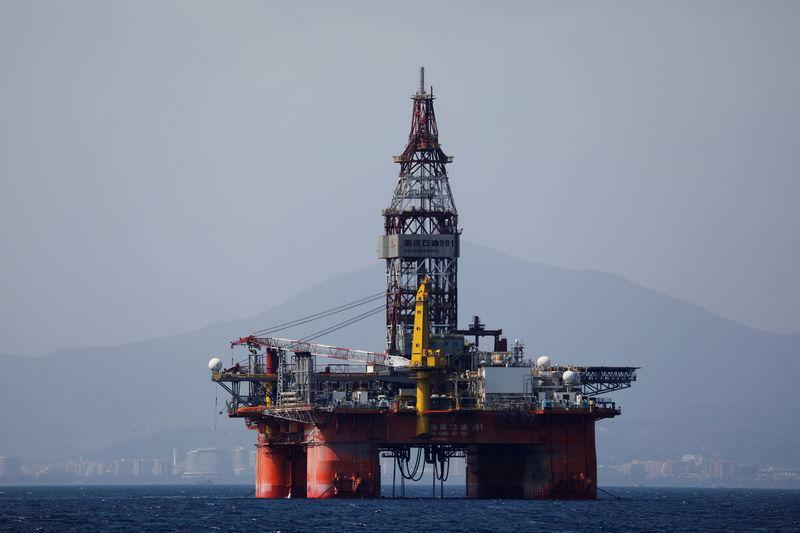 SINGAPORE/BEIJING (Reuters) - China's state energy giants are set to raise spending on domestic drilling this year to the highest levels since 2016, focusing on adding natural gas reserves in a concerted drive to boost local supplies. Responding to President Xi Jinping's call last August to boost domestic energy security, China's trio of oil majors - PetroChina, Sinopec Corp and CNOOC Ltd - are adding thousands of wells at oil basins in the remote deserts of the northwest region of Xinjiang, shale rocks in southwest Sichuan province and deepwater fields of the South China Sea. Firms are showing greater risk appetite, expanding investments faster in exploration than production, emboldened by Beijing's political push and oil near $60 a barrel, said state oil executives and analysts at consultancy Wood Mackenzie. "We shall carry through resolutely the State Council's call on stepping up domestic exploration and development and launch an offensive war," PetroChina Chairman Wang Yilin was cited as saying in an inhouse newspaper in December. "With oil prices at $50, $60 and $70...we're making decent profits," Yuan Guangyu, CNOOC's Chief Executive Officer, said last week. CNPC, Asia's largest oil and gas producer and parent of PetroChina, is boosting risk exploration investment five-fold to 5 billion yuan ($741 million) this year from 1 billion yuan last year. But with oil reservoirs maturing and new discoveries tending to be smaller and more costly, even more drilling is unlikely to reverse China's declining oil outlook, analysts say. China, set to remain the world's top oil buyer for years to come, is forecast to slip to the 10th largest global oil producer in 2020, down from No.5 for most of last decade, said Wood Mackenzie. "China will likely continue on the same path as it has in recent years – an overwhelming focus on new gas production, leading to continued decline in its oil output," said Angus Rodger, research director of Asia-Pacific upstream at Wood Mackenzie. With Beijing pushing to reduce energy import dependence and hit environmental targets, gas output is forecast by analysts to rise at 6-8 percent a year through 2020. China, the world's No.3 gas consumer, overtook Japan as the world's top gas importer in October. PetroChina, which produces some 70 percent of the country's gas output, will lead the drive, adding thousands of wells in southwestern Sichuan, northern Ordos and northwest Tarim basin, CNPC says on its website. The major is also ramping up shale development in Sichuan, seeking to catch up with Sinopec Corp which has pioneered China's nascent shale push. Despite almost a decade of drilling, shale makes up just 6 percent of China's total gas output because of complex geology and high costs of development. PetroChina raised its shale gas output 40 percent last year to 4.3 billion cubic meters, while Sinopec's production was largely flat at 6 bcm. "Controlling the largest and best acreage, CNPC has been ramping up aggressively capital and human resource deployment over the past 3-4 months in Sichuan shale," said Woodmac analyst Max Petrov who tracks Chinese majors' investment. Sinopec declined comment. CNPC did not respond to Reuters' request for comment. Beyond 2020, deepwater discoveries in the South China Sea, such as Linghui 17-2, some 150km (90 miles) off China's southernmost province of Hainan, will lend growth to China's gas portfolio. With estimated proven recoverable reserves of 2.5 trillion cubic feet, Lingshui is CNOOC's single-largest fully owned deepwater gas discovery. BG Group walked away with little success after exploratory drilling at the nearby Lingshui 22-1-1 well in 2010. Aiming to add 50 percent to gas reserves by 2025, CNOOC is expected to step up drilling in the deepwater acreage of the Pearl River Mouth basin and expand earlier major discoveries including Yacheng and Dongfang, both near Hainan province. "Natural gas is becoming increasingly popular under the government's green push. And its relatively less risky than oil under long-term off-take deals," said a state oil executive. Companies, however, will hold off drilling in disputed territorial waters of the South China Sea due to technological challenges and the lack of experienced global partners willing to risk exploring those areas, analysts said. Beijing claims about 90 percent of the South China Sea, whose estimated energy potential varies widely, although geologists believe it holds more gas than oil. Vietnam, the Philippines, Malaysia, Brunei and Taiwan also claim parts of the key waterway. Sinopec, traditionally a refiner rather than a driller, has the smallest resource base and may lag its peers, analysts say. Sinopec's proven oil reserves by end-2017 could last less than six years of production, versus CNOOC's 10 years, while Sinopec's gas reserve life of 8 years is dwarfed by PetroChina's 24 years, according to calculations based on company filings. Sinopec is expected to boost spending this year, including in developing its second shale gas target, Weirong block, in Sichuan. But the momentum of making new finds is waning, said company officials. "Sinopec is well aware of its problems, but the will to change that seems to have a bottleneck at the top as the company sees itself more of a downstream, petrochemical player," said Woodmac's Petrov.